Barry Truter was born in India, lives in Vancouver, BC, and has been a traveller for much of his life. His music and songwriting are influenced by the places he has lived and worked including India, Fiji, USA, England, Canada, and a spell at sea working on a tramp freighter. 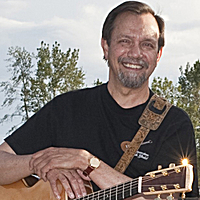 Barry is a co-founder of the Georgia Strait Guitar Workshop (GSGW), and teaches guitar privately and at music camps in the Pacific Northwest. He performs with Vancouver-based folk group Fraser Union. But above all he loves to sing and jam with friends in the kitchen, on the ferry, in a coffeehouse, at a music camp, on a protest march, at a sea festival and wherever live music can be found. As he says, "May there always be the joy of music in all our lives." Barry's latest solo cd, "Traveller", consists of originals and carefully selected covers reflecting his journeys, and supported by guest appearances from some fine Vancouver musicians.